Hans Holbein the Elder was a German painter active during the first half of the 16th century and the father of Hans Holbein the Younger, with whom he worked on various projects. His most important commission was the decoration of the high altar of Augsburg cathedral, of which few elements have survived. His portraits reveal an interest in achieving a realistic likeness of the sitters’ features, as his surviving portrait drawings reveal, but this was not the genre in which he was most active. The present pair of oils has been the subject of debate with regard to the dating, composition and the identity of the figures. The fact that the woman is located on the left, which is an uncommon arrangement, and the different scale of the two figures, suggests that they were in fact independent compositions. On the basis of a detailed study, however, Isolde Lübbeke decided that the two works date from Holbein’s mature phase and pointed to other pairs of portraits by him that use this arrangement. The female figure is depicted in profile, outlined against a dark background that emphasises the flesh tones of her face. In the male portrait, Holbein depicts the figure in three-quarter length and filling almost the entire pictorial space. Both portraits reveal an interest in conveying the sitters’ physical features in a realistic manner. These two small panels were in the collection of Count Attems in Graz where they were on loan to the Landes-Bildergalerie del Joanneum between 1861 and 1933. In 1933 they were acquired by theRohoncz collection through the Sanct Lucas gallery in Vienna where they were to be found at that date. During the time that they were in the Joanneum they were the subject of interest on the part of various authors and their attribution, made by Wilhelm Suida, dates from that period. Various aspects of the paintings have been discussed since that time, including their date, style, sitters and compositions. 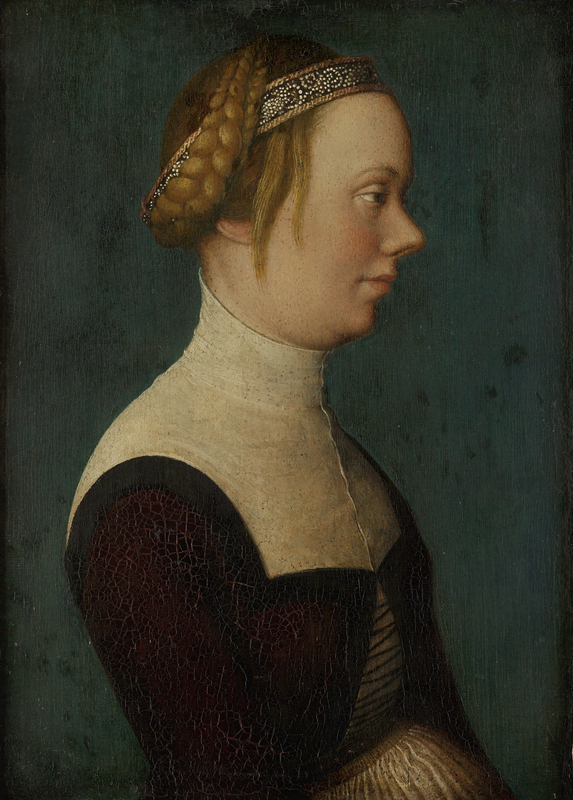 From the inscriptions on the reverse of each panel, the two works were considered to be a pair and were incorrectly identified as Martin Luther and his wife Katharina von Bora. Despite the fact that they are almost identical in size and that they share the same intense blue background (now rather altered due to age), the unusual pose of the woman on the left and the difference between the scale of the two figures has led to the suggestion that they are unrelated portraits made a different times during Holbein’s career. The woman is seen in profile, precisely outlined against the background and crisply drawn. She is depicted half-length with her arms at her sides and a bulging stomach, emphasised by her tight bodice and ruched skirt. Her head is adorned with an attractive band while her hair is caught up in a heavy plait from which two strands escape. The fact that her head is not covered by a headdress indicates that she is unmarried. The sober tones of her clothing, largely limited to black and to the white of her high-necked chemise, which make her figure seem elegant and stylised, are only contrasted by the soft, delicate tones of her skin to which the artist added small touches of crimson on the cheek and lips. The man is depicted in three-quarter profile, bust-length with his broad shoulders and heavy clothing occupying most of the picture space. Holbein’s portrait drawings indicate that he was interested in the physiognomy of his sitters. In addition to that interest, the present portraits also manifest the artist’s realistic style in the way he depicted the sitter’s features with little interest in idealisation, for example, in the prominent noses of both sitters, the bags under the woman’s eyes or the man´s curious hairstyle with his hair continuing under his ears. Following a detailed stylistic and technical study of the two panels, Lübbeke concluded that they were both painted at the same period and that the soft modelling indicated a date of around 1518-20 during the artist’s mature period. With regard to the difference of angle and pose used for the two sitters, Lübbeke drew attention to similar examples by other artists such as the two portraits attributed to Sebastiano Mainardi in the Gemäldegalerie, Berlin in which a couple are depicted in a similar way to that found in the present panels.